Everyone who knows anything about the gospels—and even those who don’t—knows that Jesus was a friend of sinners. 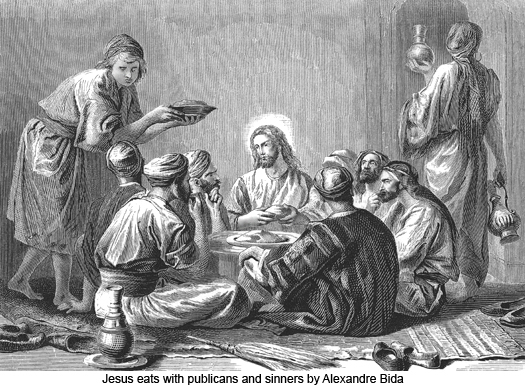 He often drew the ire of the scribes and Pharisees for eating with sinners (Luke 15:2). Jesus clearly recognized that one of the insults hurled against him was that he was “a glutton and a drunkard, a friend of tax collectors and sinners!” (Luke 7:34). As Christians we love to sing of this Pharisaical put-down because it means that Jesus is a friend to sinners like us. We also find ourselves challenged by Jesus’ example to make sure we do not turn away outsiders in a way that Jesus never would. Here we have an example of a whole truth being used for a half truth in the service of a lie. Once, as a younger man in ministry, I made an offhanded comment about how Jesus “hung out with drunks.” I was gently and wisely corrected by an older Christian who had himself overcome alcohol addiction. He challenged me to find anywhere in Scripture where Jesus was just “hanging out” with people in a state of drunkenness. In an effort to accentuate the grace of Christ, I stepped beyond (around, over, and away) from the biblical text and made it sound like Jesus loved nothing more than to yuck it up with John Belushi in Animal House. If we are to celebrate that the Lord Jesus is a glorious friend of sinners—and we should—we must pay careful attention to the ways in which Jesus actually was a friend to sinners. Omitting the story of the woman caught in adultery (for reasons of textual criticism), I count five main passages in the gospels where Jesus is chastised for getting too close to sinners. Matthew 9:9-13; Mark 2:13-17; Luke 5:27-32 – This is the story of Jesus calling Matthew the tax collector to be his disciple. We find Jesus reclining at table with many tax collectors and sinners, “for there were many who followed him” (Mark 2:15). When the scribes and Pharisees grumble about the company he keeps, Jesus tells them that he has “not come to call the righteous but sinners to repentance” (Luke 5:32). Matthew 11:16-19; Luke 7:31-35 – Here Jesus rebukes the “people of this generation” because they rejected John the Baptist for being too tight and reject the Son of Man for being too loose. It’s from this incident that we get the phrase “friend of sinners.” We should note that it was an insult heaped upon Jesus by his enemies. This doesn’t mean Christ didn’t own it and we shouldn’t sing it, but it suggests he may not have owned it in every way. If Jesus was not a “glutton and drunkard” as his opponents thoughts, so he may not have been “a friend of tax collectors and sinners” in exactly the way they imagined either. Luke 7:36-50 – Right on the heels of this story comes another one like it in Luke. A sinful woman anoints Jesus with expensive ointment and wipes Jesus’ feet with her tears and the hair of her head. When Jesus is corrected for letting this “sinner” touch him, he reminds Simon that those who are forgiven much love much. In the end, Jesus forgives the woman her sin and announces “Your faith has saved you; go in peace” (Luke 7:50). Luke 15:1-2 – The setting for the parables of the lost sheep, lost coin, and lost son of Luke 15 is found in the first two verses of that chapter. As the tax collectors and sinners “were all drawing near” to Jesus, the Pharisees and scribes grumbled that Jesus was receiving them to eat with them. The three parables that follow demonstrate how God seeks out the lost (15:3, 8, 20) and how pleased God is when sinners repent (15:7, 10, 21-24). Luke 19:1-10 – Again, the Jewish leaders grumble because Jesus “has gone in to be the guest of a man who is a sinner” (Luke 19:7) Though Zacchaeus repents and is a changed man (19:8), the Jews simply cannot accept that the Son of Man came to seek and to save the lost (19:10) and that this notorious tax collector has been saved (19:9). So what lessons can we draw from these episodes? In what way was Jesus a friend of sinners? Did he have a grand strategy for reaching tax collectors? Did he indiscriminately “hang out” with drunks and prostitutes? Was he an easy going live-and-let-live kind of Messiah? What we see from the composite of these passages is that sinners were drawn to Jesus, that Jesus gladly spent time with sinners who were open to his teaching, that Jesus forgave repentant sinners, and that Jesus embraced sinners who believed in him.